It is no secret that we are living in an increasingly litigious society. What may come as a surprise, though, is that we are far more likely to be involved in a costly legal dispute with a former loved one than we are with a stranger. In Love and Money, Ann-Margaret Carrozza will help you to easily understand and implement essential legal strategies to prevent you from doing legal battle with someone you once shared Thanksgiving dinner (or a pillow) with. After learning how to erect legal barriers against external wealth destroyers and evildoers, the focus of the book moves to internal wealth destroyers. 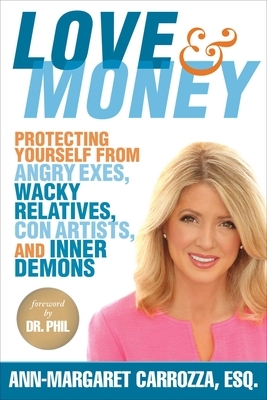 Readers will learn how to identify and combat internal wealth repellants such as low self-esteem, fear, and stress. Becoming and remaining wealthy requires more than just money. This book provides a unique education about the interrelated nature of the internal and external laws of wealth and how to put them both to work for stronger relationships with one's finances and loved ones. Ann-Margaret Carrozza is a practicing wealth and estate-planning attorney who served as a New York State assemblywoman for fourteen years. She has the highest possible attorney rating and is regularly featured as an expert legal contributor on television shows such as ET, Extra, Inside Edition, Good Morning America, FoxBusiness, The Doctors, and Dr. Phil. She lives on Long Island, New York, with her husband, William Duke, MD, their sons, Billy and Danny, and furry family members, Lucky and Rocky.